Rotherham industrial and commercial recruiter Stafforce Recruitment has opened new offices as it heads towards a £200m turnover within five years. With a head office on Percy Street in Rotherham town centre and a UK-wide network of sites, Stafforce offers a range of services to clients through its Stafforce Recruitment and Nicholas Associates brands. With two new branches – Carlisle and Ipswich - Stafforce has now opened six branches in 2015 alone, bringing its national network to 30 on-site operations and locations. Stafforce first came to East Anglia in 2010 to handle the demand for workers there from a long-standing national client. In 2013, the firm secured a £1.4m contract to recruit 60 people a day with Europe's biggest sushi manufacturer, ichiban UK LTD of Stowmarket. With a dedicated office at the site, consultants supplied up to 120 temporary food production operatives a day and managed all aspects of the personnel function for the smooth running of a shift pattern that covers a 24/7 operation. The company has recently recruited Richard Hayes as an operations manager for the south of England and with support from Stafforce's new branch, the manufacturer is again boosting its payroll of 370 full time and temporary local staff to meet summer demand. Tony Boorman, director at Stafforce, said: "The branches in Carlisle and Ipswich bring our national network to 30, which is a milestone in itself and there are others in the pipeline that will see the Stafforce brand grow in strength and number across the UK." The company supplies temporary and permanent staff, from first time job seekers to semi-skilled workers, to manufacturing and production companies and the commercial and industrial sectors. From head offices on the Sheffield Business Park, executive recruiter Nicholas Associates sources senior management and director-level candidates. Nicholas Associates has recently opened a new office in the North East, in Redcar, Cleveland. John Burluraux has been recruited as a managing consultant to join the leadership team and head up this new operation. As part of an ambitious five-year growth strategy, a far-reaching restructure of its senior management team was carried out earlier this year. In addition, Victoria Gribben has been appointed in a newly-created senior position of corporate development director. With a background in corporate finance, Gribben will be identifying and executing merger and acquisition opportunities on behalf of Stafforce. In 2014 the company recorded sales of £66m and is forecasting to grow that to £81m in 2015, with similar growth rates predicted for subsequent years. The aim is to achieve a £200m turnover within five years. Nicholas Associates Limited is also seeking acquisitions that are non-core to the Stafforce brand but complement the specialist niche services that the Nicholas Associates brand has to offer. Opportunities across a number of sectors including specialist financial services, manufacturing and distribution are being actively investigated. 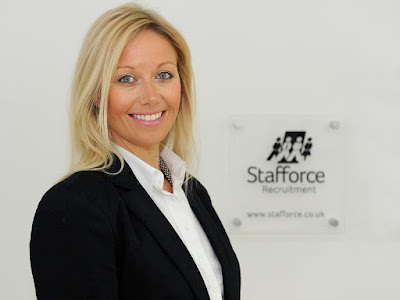 Victoria Gribben, corporate development director at Stafforce (pictured), said: "I'm thrilled to be joining Nicholas Associates Limited at such an exciting time and to be working alongside Nick Cragg and the group's directors to support the company in achieving its growth aspirations. "The role is the perfect opportunity for me to be actively involved in acquiring, integrating and shaping businesses into the group and put into practice the experience and knowledge I have gained in my advisory capacity to help shape the business for continued future success." Established in 1977 by local entrepreneur, now chairman, Nick Cragg, the growth strategy also includes preparations for longer term succession.